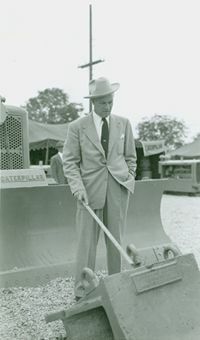 Caterpillar Tractor Company, seeking to improve the sales and service of its products in eastern North Carolina, and believing the concentrated efforts of two dealers would better serve a territory the size of the Old North State, established a second dealer, with headquarters in Raleigh. The management of Caterpillar chose James Gregory Poole, Sr., and his uncle, William Lewis Gregory, to form the new eastern NC dealership. 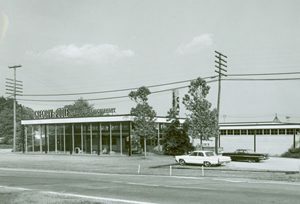 Gregory-Poole Equipment Company began operations on April 1, 1951 at 3623 Hillsborough Street, Raleigh, and at a branch in New Bern. The Company soon became widely respected in the sales and service of heavy construction and materials handling equipment. In July, a heavy equipment sales and service branch was added in Wilmington, NC, and in December of the same year the home office was moved to its present Raleigh location at 4807 Beryl Road. By means of a trade of stock in Florida-based Seminole Rock Products, Poole and his family obtained W.L. Gregory’s shares in Gregory Poole Equipment Company and became the sole owners. J. Gregory Poole, Jr., was elected President. Gregory Poole Equipment Company established the Industrial Division for the sale and service of materials handling equipment, operating initially from 3705 Hillsborough Street, Raleigh. The Industrial Division expands by adding a branch operation in Wilmington, NC. A new heavy equipment branch was opened at the intersection of U.S. Highway 17 and Spring Road in Washington, NC, replacing the outdated New Bern facility with a modern shop located in the center of the booming eastern market. A new heavy equipment branch was opened on Highway 17-S in Wilmington, NC, in November; after several years at another address, the Wilmington Industrial Division relocated to this state-of-the-art shop in Brunswick County. In October, a new Fayetteville facility opened; this store, located on U.S. Highway 301 South at Interstate 95, serves both Construction and Industrial Division customers. In November, the Industrial Division expanded into South Carolina, with facilities in Charleston and Florence. The Power Systems Division was launched at the new Blue Ridge Road facility in Raleigh, providing sales and service for engines in power generation, marine and truck applications. On the Company’s 45th anniversary (April 1, 1996) J. Gregory Poole, III, became President and Chief Operating Officer. J. Gregory Poole, III purchased the company from J. Gregory Poole, Jr. and became the Chairman, CEO and third generation Poole owner. Gregory Poole Equipment Company celebrated it’s 50th year of providing Cat® products, service and support to eastern North Carolina. Gregory Poole lift Systems expanded to Virginia, opening branches in Chesapeake and Richmond. In July, the Raleigh truck engine service operations moved to the new On-Highway Engine Truck Center in Garner, NC to better serve our On-Highway Engine customers. In December, Gregory Poole and six other southeast Cat dealers acquired Pioneer Machinery. Pioneer Gregory Poole now serves the forestry industry in eastern NC from three new NC branch locations: Pittsboro, Elizabethtown and Greenville. In February, a new facility was opened in Mebane, NC. This facility houses a 12,800 sq. ft. parts warehouse and a 30,000 sq. ft. service center to support Gregory Poole’s Construction, Truck and Rental Store customers. Gregory Poole began a partnership with Blue Bird Buses across the entire state of North Carolina for sales, parts and service of school buses, activity buses, etc. Expanded Lift Systems Division through the acquisition of the Virginia, based territory of LiftOne, a division of Carolina Tractor & Equipment. Gregory Poole Lift Systems now has 10 branch locations serving eastern SC, NC and most of VA. In June, launched Compressed Air Systems division for the sale and support of air compressors and accessories. May – Gregory Poole reached an agreement to acquire Cincinnati, Ohio based Advanced Handling Systems, Incorporated (AHS), a full service provider of integrated fulfillment and distribution solutions within the material handling supply chain industry. Under this agreement AHS will operate as an affiliate of Gregory Poole Equipment Company and work in conjunction with the Gregory Poole Lift Systems Division. April – Acting on our commitment to providing you the best service in each aspect of your business with us, we launched our new operating system that we have named GPAX. This new system will impact every facet of our business together, adding speed, efficiency, better service, and growth capacity. We’ve invested a great deal of time and money to create this new system so that it will truly meet the needs of customers like you for generations to come. October – Driven by the company’s desire and directive to grow and by its strategic goal to be the recognized leader in the products it offers, Gregory Poole acquired the operations and assets of Dougherty Equipment Company, Inc. and VBS Inc. Material Handling Equipment and certain assets of Briggs Equipment, Inc. The company was also appointed as an authorized dealer of Hyster® and Yale® lift trucks across four states and one of the region’s largest overall material handling dealers. It is now the Yale® dealer in portions of North Carolina, South Carolina and Virginia, and the Hyster® dealer in most of Virginia and in portions of North Carolina, South Carolina and West Virginia. April – Gregory Poole Equipment Company celebrated 65 years in business. Gregory Poole Equipment Company employs over 1300 employees at 21 facilities in Raleigh, Beaufort, Fayetteville, Garner, Greenville, Mebane, Pittsboro, Rocky Mount, Washington, Wilmington, and Wanchese, North Carolina, as well as Richmond, Roanoke, Winchester, Harrisonburg and Chesapeake, Virginia and Florence and Charleston, South Carolina.